Hi everyone, hope you all had a nice valentines day, no matter what you got up to or who with! 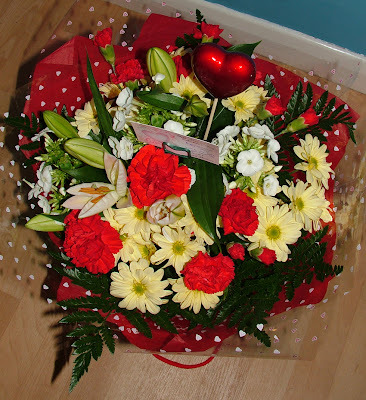 I was lucky enough to recieve these wonderful flowers from Mark, how gorgeous are they? Flowers always manage to make me smile, and make me feel that little bit special, so thank you Mark! Now to thank Laura of Beads by Laura for her 'You Make My Day Award' which she has very kindly given one to me! (see my award on the left) What a lovely thing to do. I'll be passing this award onto 5 people later. Talk to you soon! Oh what gorgeous flowers, Janine! Chris sent me a lovely box of chocolates . . . yum! Ooooh nice, enjoy your chocs Laura! !